With the constant pressure on a dancer’s body from aggressive training, self-care is an important part of injury prevention for dancers. 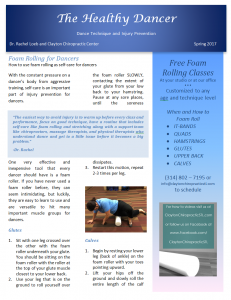 One very effective and inexpensive tool that every dancer should have is a foam roller. 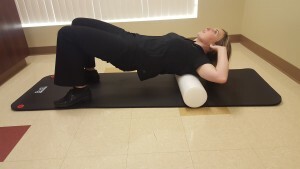 If you have never used a foam roller before, they can seem intimidating, but luckily, they are easy to learn to use and are versatile to hit many important muscle groups for dancers. 1. Sit with one leg crossed over the other with the foam roller underneath your glute. You should be sitting on the foam roller with the roller at the top of your glute muscle closest to your lower back. 2. 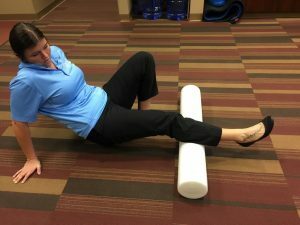 Use your leg that is on the ground to roll yourself over the foam roller SLOWLY, contacting the extent of your glute from your low back to your hamstring. Pause at any sore places, until the soreness dissipates. 3. Restart this motion, repeat 2-3 times per leg. 1. Begin by resting your lower leg (back of ankle) on the foam roller with your toes pointing upward. 2. Lift your hips off the ground and slowly roll the entire length of the calf muscle from bottom to the top, to just below the knee. Pause at any sore areas, applying more pressure until the pain dissipates, and continue on up the leg. 3. Repeat this movement 2-3 times each leg. 1. Start by placing the foam roller at the top of the hamstring, right below your glute. 2. Work the roller down towards the back of the knee, pausing at any sore spots until the pain dissipates. 1. Start by lying face down with the foam roller up near your hips. This movement can be done targeting one or both of your legs at a time. 2. Work the roller down your leg to just above the knee. 3. The quadriceps muscle is actually a large group of muscles, because of this you may need to address different areas of the muscle. This can be accomplished by rolling at different angles, turning the hip in or out can expose different areas. 2. Lift your hips off the floor to start the motion. Roll your body down, over the roller until it reaches your upper shoulders, keeping your hips off the ground through the entire range of motion. Do the different sizes, colors, and textures make a difference? Most exercises can be done on the short foam rollers making them ideal for traveling to and from class, but few upper back exercises can only be done on the longer exercises making them perfect for home or at the studio. The colors usually represent the firmness. White is the softest making them best for beginners, black is the most firm making them more aggressive in the muscles. There are also textured foam rollers that make them even more intense. It is always better to start with the least aggressive. Foam rolling can be done daily, but just like any other exercise, start slow and build up. While foam rolling after class may help muscles recover from the strenuous exercise, I recommend doing it before class to help decrease muscle density and promote a better warm-up.